Summary. Studied characteristics of cardiovascular activity in people with normal hearing and deafness during mental activity. It is established that people with normal hearing differ in both the best quantitative and qualitative indicators of information processing, and in the balance of regulating mechanisms of cardiac rhythm in comparison with deaf ones. The study of spectral characteristics of cardiac rhythm and correlation analysis showed low effectiveness of regulating mechanisms of cardiac rhythm in the deaf persons, which may be associated with a high risk of cardiovascular and cardiac pathology. Key words: cardiovascular activity, information processing, regulating mechanisms, deaf and healthy people. It is known that any mental activity necessarily causes a different degree of neuro-psychological stress, which is reflected in the cardiovascular system in the form of various compensatory reactions [1, p. 153; 6, p.87]. According to the modern views, the variability of the heart rhythm can reflect the degree of tension of regulatory systems [2, p. 11]. The practical interest is the study of the spectral characteristics of the HR in people with auditory deprivation, whose number is steadily increasing. The goal of the research is to investigate the features of the spectral characteristics of HR in the patients with auditory deprivation during processing of complex visual information. We studied the spectral characteristics of HR in 34 men aged 18-26 without auditory problems and 27 their peers with auditory deprivation at rest and while processing of visual information. The investigations were carried out in compliance with the bioethical rules and regulations of the Helsinki Declaration of 1975, after a voluntary written agreement of the investigated persons. The information was processed using computer complex “Diagnost 1M” [4, р. 141-142]. We used geometric shapes as a visual load for the differentiation of information. We found the number of incorrect reactions, the total number of visual stimuli processed for 5 minutes of the differentiation of positive and inhibitory stimuli in the “feedback”. The spectral characteristics of HR were registered on the device “Cardiolab+” at rest and during information processing. We analyzed the indicators of spectrum total power (Total Power - TR ms2), the power of spectrum at very low frequencies (the VLF ms2), low frequencies (LF ms2,) and high frequencies (HF ms2) [3, р. 1050; 5, р. 201]. The statistical processing of the obtained results was carried out using methods of mathematical statistics and the packages of programs Exel and Statistica for Windows 8.0. The reliability of the changes and the differences between the comparative values was estimated according to the non-parametric Wilcoxon-Mann-Whitney criterion. The existence of a relationship between the indicators was checked by the calculations of the Spearman correlation coefficient (rs). Differences between groups and the existence of correlation dependence were considered to be reliable at р< 0.05. We found that the number of the processed visual information in the individuals with deprivation was reliably low than in their peers with normal hearing, 588±72.9 and 737±52.1 stimuli, respectively, for 5 minutes of testing (р<0.05). Thus, the differentiation of visual information by the deaf people was accompanied with a great number of mistakes. The analysis of the background indicators of the spectral characteristics of HR did not found reliable differences in the indicators of the investigated groups (р>0.05). At the same time, the quantitative values of VLF and LF were higher in the persons with auditory deprivation than in their healthy peers; it might show the tendency to less economic use of the reserve opportunities of the heart of the deaf people [7, р. 129; 9, р. 185]. The analysis of the spectral characteristics of HR during information processing showed dominating influence of vegetative provision of visual information processing in the persons with different state of auditory function (Table 1). Note: the table represents the values of median (the first and third quartiles); * - reliable differences р<0.05, ** - р<0.01 relatively the indicators of background within the boundaries of the group; # - reliable difference р<0.05 relatively the indicators of healthy individuals during work. Table contains own results. The reliable decrease of quantitative values of LF, HF and ТР was found in the deaf and the individuals with normal hearing during differentiating stimuli (р<0.05-0.01). At the same time, this decrease was more significant in the healthy individuals than in the persons with auditory deprivation (р<0.01). Besides, the expressed part of humoral-metabolic channel in the regulation of HR during visual information processing was found in the individuals with normal hearing function if compared with the deaf in which its influence on the regulation of heart work was reliably decreased (р<0.05). It is known that the mobilization of energy and metabolic reserves in different functional states is reflected by the changes in the power of the HR spectrum [3, p. 1060]. According to the modern approaches, the contribution of HR waves into the total spectral power in the VLF range in normal state is 15-30%, LF is from 15 to 35-40%, and the NF is 15-25% [2, p. 17, p. 26]. We conducted a comparison of the waves of different ranges of the surveyed persons, recorded in the resting state and during mental activity. It is established that contributions to TP of healthy and deaf people in conditions of the rest did not have meaningful differences and correspond to general clinical norms. Analysis of the composition of the TP in surveyed persons in conditions of the mental activity revealed that the proportion of the VLF waves in the deaf persons decreased, while in healthy persons it increased on 25.1% (p <0.01) (figure 1). According to A N Fleishman, the power of the VLF waves - the HR range is a clear marker of the deployment of metabolic alterations [8, p. 24, p. 77]. It is not excluded that an increase in the contribution of the WLF into the TP may indicate a relative loss-making effect of the adaptive response in healthy individuals, while its reduction in the deaf persons can evidence of the tendency of the depletion of energy reserves. The analysis of the LF waves in the TP of the various groups of surveyed persons, recorded in conditions of mental activity, indicated the increasing of their fate in the deaf people. Despite the fact that the increment of the index was low, the contribution of the LF waves to the total cardiac output increased significantly (p <0.05). Such dynamics indirectly points to the development of the tension in the system of regulation of vascular tone of the deaf individuals. Changes in the waves of the HF band in the TP of healthy and deaf people during the mental activity of the subjects were of a multi-directional nature, but in both cases they did not reach the limits of reliability (p> 0.05). Thus, matching of the waves of the cardiac spectra of the surveyed persons showed that the regulatory mechanisms of healthy individuals were characterized by flexibility and high adaptability, while adaptive changes of deaf people were rigid and narrow. The comparison of spectral indicators of HR while differentiating positive and inhibitory stimuli by the deaf and healthy individuals showed higher tension of the mechanisms of vegetative provision in the persons with auditory deprivation especially due to the greater rigidity of sinus rhythm during the work and the expressed tone of sympathetic innervation (р<0.5), which was observed on the background of the decrease of the quality of differentiating complex visual information. The correlation analysis between the indicators of the quantity of the processed visual information and the spectral characteristics of HR during the test was used to check the obtained data. The reliable correlation (р<0.05) with LF, HF, TP was found in the deaf between the quantity of the processed information and spectral characteristics of the heart activity, and in the persons with normal hearing – with VLF, HF and TP. Thus, statistically reliable differences between the spectral characteristics of the HR while differentiating visual information and the ambiguity of the obtained correlation between the quantity of the processed information and the indicators of the HR regulation in the people with different status of auditory function show the differences in the regulatory processes of the heart rhythm control. The obtained results allow to draw the following conclusions: the individuals with normal hearing were characterized with better performance of the task in information processing and high lability of the regulatory processes of the heart rhythm if compared to the persons with auditory deprivation; the analysis of the spectral characteristics of the heart rhythm in the persons with normal hearing and auditory deprivation, as well as correlation showed low efficiency of the regulation mechanisms of the heart rhythm in the deaf. We believe that the results of the study of cardiovascular activity, obtained in the context of mental activity, are sensitive indicators of the state of the regulatory mechanisms of the cardiac rhythm. It can serve as prognostic criteria for the risk of cardiovascular disease, and can also be used in the system of professional orientation of young people with normal hearing and young people with their disabilities. The results can be used to monitor the functional state of the deaf persons, helping to avoid the development of fatigue and strain on the work of the brain and heart. Akselrod S. Components of heart rate variability / S. Akselrod // Heart rate variability. - N.Y.: Armonk. 1995. - P. 146-164. Баевский Р.М. Анализ вариабельности сердечного ритма с использованием различных электрокардиографических систем (часть 1) / Р.M. Баевский Г.Г. Иванов, Л.В. Чирейкин и др // Бюллетень аритмологии. - 2002. - № 24. - Р. 9-42. Heart rate variability: Standards of measurement, physiological interpretation and clinical use. Task Force of European Society of Cardiology and the North American Society of Pacing and Electrophysiology / Circulation. -1996. - Vol. 93, N5. - P. 1043 - 1065. Макаренко М.В. Методика проведення обстежень та оцінка індивідуальних нейродинамічних властивостей вищої нервової діяльності / М.В. Макаренко // Фізіологічний журнал. – 1999. 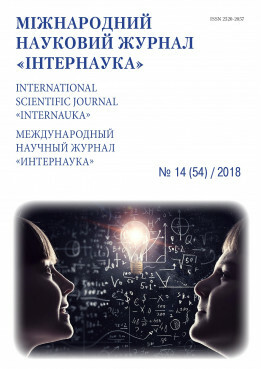 – 45, № 4. – С. 125 – 131. Richter D.W. Cardiorespiratory control / D.W. Richter, K.M. Spyer // Central regulation of autonomic functions. - N.Y.: Oxford Univ. Press, 1990. – P. 189-207. Яблучанский Н.И. Вариабельность сердечного ритма / Н.И. Яблучанский А.В. Мартыненко. - Харьков: КНУ. - 2010. - 131 с.
Григорьева Л.П. Влияние факторов депривации на перцептивно-когнитивное развитие детей / Л.П. Григорьева // Вестник МГЛУ. - 2014, Вып. 16 (702). - С. 128-137. Флейшман А.Н. Вариабельность ритма сердца и медленные колебания гемодинамики: нелинейные феномены в клинической практике / А.Н. Флейшман. - Новосибирск: Изд-во СО РАН. - 2009. - 194 с.
Юхименко Л.І. Особливості функціонування мозку та серця під час переробки інформації у людей з різним статусом слухової функції / Л.І. Юхименко, С.М. Хоменко // Матеріали IV Міжнародної науково-практичної конференції, Луцьк: Вежа-Друк, 2018. – 2018. – С. 184-185.